What's dumb? 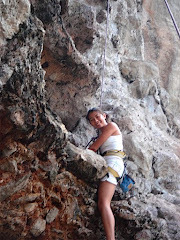 Having a 2hr rock climbing class right after swim training. It basically made the session kind of pointless since my arms starting trembling pretty much 1/3 way into the session. Which made for a rather short climb session. Ah well, you learn from your stupidity eh? I overdid Saturday. I wanted to swim, climb, get some of my assignment (I'm taking some graduate diploma in compliance) done, head to church and do all that before my grandmother's 80th birthday dinner. When I got to dinner I was exhausted. But it was good fun meeting with the extended family and catching up.